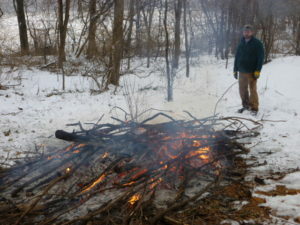 Is it safe to burn that debris pile today? Ask yourself, is it safe to burn that debris pile today? Burning Questions: Is my campfire really a campfire? The first step in campfire safety is to understand the difference between a campfire and a fire to dispose of debris. A campfire is kept small and used for cooking or warming. • Campfires are solely for warming or cooking purposes, are smaller in size and comprised of clean and dry wood, contained within a designated fire ring or surrounded by rocks. Campfires are allowed anytime, except when Emergency Burning Restrictions are in effect. 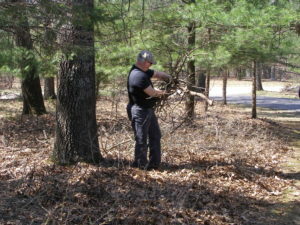 Burning in a fire ring with the intent to eliminate debris is not a campfire. 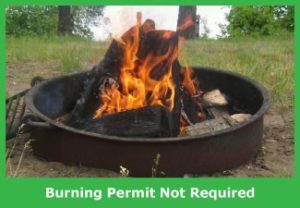 • Burning in a fire ring with the intent to eliminate debris is NOT a campfire and does require a burning permit in DNR protection areas. 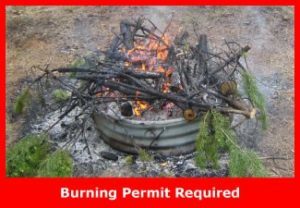 A permit can be obtained from your local Emergency Fire Warden, or from the website http://dnr.wi.gov keyword “burn”, or by calling 1-888-WIS-BURN (947-2876). No matter what type of outdoor fire you have, check the daily burning restrictions for your area before ignition and never leave a fire unattended. Don’t forget that embers can remain hot for days after the fire has burned down to ashes, so make sure to use plenty of water and stir the ashes to ensure they are out cold. Remember, you may be held responsible for all suppression costs and potentially any damages associated if your fire escapes. The Wisconsin Department of Natural Resources urges people to take precautions and prevent wildfires caused by fireworks now and during the next few weeks. 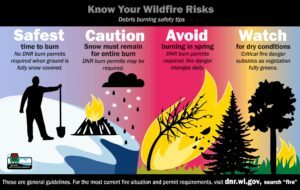 Most wildfires caused by fireworks occur around the July 4th holiday or under extended drought conditions, but the reality is, wildfires can occur anytime the ground is not completely snow-covered. Exploding fireworks, such as firecrackers, m-70’s, bottle rockets, and roman candles, cause the most fireworks-caused wildfires. Paired with hot and dry weather, even sparklers and fountains pose a significant threat in dry grassy areas. Anyone responsible for starting a wildfire in Wisconsin is liable not only for the cost of putting the fire out, but also for any damages. Fireworks are restricted in Wisconsin and permits may be required. It’s best to check with local officials before purchasing and lighting them. A city, village, town or county may also enact an ordinance more strictly limiting fireworks sales or possessing them. In addition, the DNR does prohibit the use of all fireworks on state lands including state parks, state forests and state owned public hunting and fishing properties. Anyone planning on camping in a Wisconsin state park or forest for the Fourth of July should enjoy fireworks displays in nearby communities — not at picnic areas, campsites or other areas within state parks, forests and trails. As of the last week of June, fire dangers levels throughout Wisconsin were low across the state, but even in low fire danger times, fireworks can start wildfires. 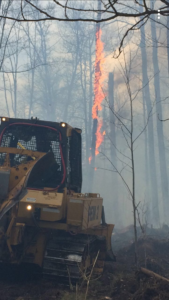 So far in 2018, DNR records show nearly 700 wildfires have burned more over 1,800 acres in DNR fire protection areas of Wisconsin. Wildfires caused by fireworks only amount to 5 percent of the annual total; however, these fires typically occur in a condensed timeframe around the Fourth of July holiday. Property owners at an annual association meeting in Adams County test their wildfire knowledge. 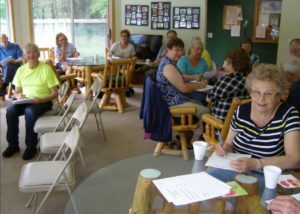 Do you have a meeting or event with your neighborhood association this summer? If your area is at risk to wildfire then this is a great opportunity to raise awareness of fire risk, educate people about local burning restrictions and review actions people can take to prepare their properties ahead of the flames. Learn more at dnr.wi.gov, search “fire”. Wildfire danger starts to change as the vegetation greens up and we get regular rainfall. Green up of vegetation and regular rains have kept fire danger Low to Moderate in southern Wisconsin. Fire danger ranged from Moderate to Very High in northern Wisconsin. The progression of green up statewide and predicted rain over the weekend is expected to quell the fire danger even further. Over the past week, 72 wildfires burned 147 acres in DNR Protection Areas. Recent wildfire causes have been equipment, debris burning, fireworks, power line, railroad and campfires. Firewise Tip: Make sure campfires are made in a fire-safe pit or container. Clear an area 10 feet around the fire pit and never burn when it’s windy. Before leaving, drown your campfire thoroughly with water, stir the ashes and add more water until it’s out cold. This concludes the wildfire report until conditions cause the fire danger to rise. As a recap, 639 wildfires burned 1,802 acres this spring; 53 structures were destroyed and another 441 were threatened, but saved with firefighter assistance. Be mindful of the weather and any drying conditions as we head into summer. Stay informed of statewide fire danger by checking our Fire web page as a part your outdoor work and recreation routine. Homes can survive a wildfire! 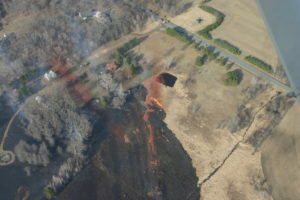 The Pleasant Valley Fire in Eau Claire Co. occurred on April 30th, burned 122 acres and 1 structure. Fortunately, 19 structures were threatened and saved. With fire season still lingering in the north, the DNR has reported 53 structures destroyed by wildfires so far this year. The good news is, 439 were also threatened yet saved with firefighter assistance. To find out if your home or cabin is a high wildfire risk area, ask yourself these questions: Is your place surrounded by oak or pine trees? Are your rain gutters full of pine needles? 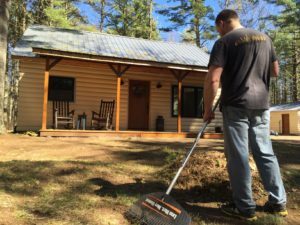 Is your lawn covered with leaves? 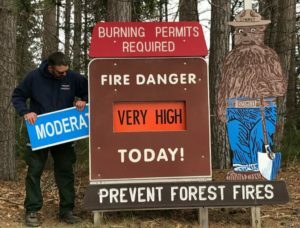 Is there a Smokey Bear fire danger sign in your community? You can help firefighters better protect your home and property by making simple changes to reduce wildfire risk. Statewide fire danger ranged from Low to Extreme this week, depending on progression of green-up and rainfall received; 68 fires burned 141 acres in DNR Protection Areas. 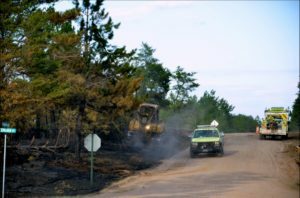 The largest fire of the week was the “White River Fire” in Bayfield County which burned 42 acres and was caused by a campfire. The main fire causes this week were debris burning (e.g., brush, leaves, trash, burn barrel, broadcast burning) and equipment (e.g., vehicle exhaust, sparks from tow chains dragging, farm disking machine). People are urged to continue to use caution with all types of outdoor burning, campfires, ash disposal and equipment use. Property owners are reminded to remain present when burning debris in a barrel or on the ground – should your fire escape, you can be held responsible for the cost of fire suppression and any damages resulting from the escaped fire. Clear an area around the pile or barrel and make sure a hose is attached to a working spigot. Wet down the burned area before leaving. Stay aware of the current fire danger for your area by checking our website: dnr.wi.gov, keyword “fire”. Firewise Tip: Practice safe towing. Chains dragging on the road can ignite dry grass along the road. Use appropriate safety pins and hitch ball to secure chains. If you need to stop and check what you’re towing, do not pull your vehicle over dry grass – hot exhaust and mufflers can start fires.